Manchester is easy to explore, with an excellent public transport system and good connections throughout the area. The city of Manchester has an efficient network of local trams, buses and trains. It is often cheaper to travel during off-peak times, after 09:30 on weekdays and all day during the weekends. 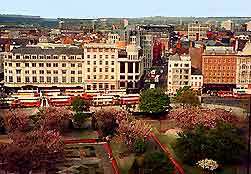 Renting a car is often the preferred method of transport for excursions from Manchester and it is relatively easy to travel around the area by car. There are a number of major roads and motorways situated on the outskirts of Manchester, such as the M6 to Wallsall and Birmingham (south), the M61 to Preston (north-west), the M62 to Dewsbury and Liverpool (respectively east and west), and the M66 to Bury (north). Manchester has a range of tickets and passes to suit the needs of travellers in the city. The 'Day Saver' ticket is an ideal option, allowing a choice of bus, train and tram transport combinations. Manchester is home to the third largest airport in the United Kingdom and Manchester Airport (MAN) is Manchester Airport (MAN) is located just 16 km / 10 miles south-west of the city centre. This important, busy airport deals with more than 50,000 passengers each week and comes with modern amenities. Manchester Airport (MAN) is conveniently situated halfway between London and Edinburgh, while the city is also relatively close to Birmingham and Leeds, all of which have large and busy airports. The city of Manchester is served by a number of major roads and motorways. Road access is excellent with more than half of the UK's motorway network passing nearby. The encircling M60 motorway is the city's principal motorway, which allows easy access to the rest of Greater Manchester. Although the traffic in and out of the city can be heavy during the busy commuting hours (07:30 to 10:00 and 16:00 to 18:00), driving in central Manchester is fairly easy. Many visitors flying here choose to rent cars upon arrival and these are the best method of transport when travelling outside of the city, to explore the surrounding countryside and nearby towns. There are a number of large parking garages and off-street parking areas available in Manchester, although some roads are restricted to residents only and parking permits may be required. Book your Manchester Car Rental here. Manchester is well pedestrianized and one of the best ways to travel around is by foot. This is an excellent way to see some of the city's numerous tourist attractions, museums, galleries and landmarks. Finding your way around central Manchester is very straightforward and many of the city's major sights and attractions are within easy walking distance of each other. 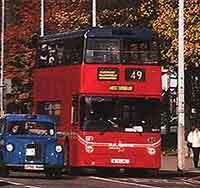 The bus system covers Manchester city well and buses in the region are heavily used by both locals and tourists alike. Buses offer a cheap way to travel in Manchester and the surrounding areas, and coaches travel to many other towns, cities and areas nearby, including Bolton, Cheshire, Chester, Liverpool and also London. Bus passes are available for set periods and these can be particularly useful when travelling in Manchester. There are numerous bus stops throughout the city, with bus timetables and route information. The city's impressive light railway / tram system in known as the Manchester Metrolink and allows fast travel in the centre and further afield. There are regular routes travelling to the city centre from Altrincham, Bury and Eccles, and the Metrolink is a popular way to get around. Manchester has four main train stations, providing travel throughout the United Kingdom. Handling around 60,000 train passengers every year, the largest and most popular station is the Piccadilly Train Station, in Manchester city centre, with regular trains travelling to cities include Birmingham, Cardiff, Edinburgh, Glasgow, Liverpool, London, Norwich and York. Other train stations in the city include those of Victoria, Manchester Oxford Road and Deansgate. Taxi cabs in the city of Manchester are one of the most popular and convenient ways to travel short distances. They can be easily caught from the many taxi ranks in the city centre, outside of the train station and at Manchester Airport. Taxis are usually fairly inexpensive and in the more quiet districts of Manchester, they can be ordered by telephone - your hotel will be happy to recommend many reputable cab firms. Additional charges are often made for luggage, journeys late at night, extra passengers and travel on public holidays, so it may be worth clarifying any extra charges before starting your taxi journey. Bicycles are a popular way to travel around recreational areas of Manchester in particular and much the city is generally very flat, although there are some steep hills on the outskirts. There are also numerous cycle trails and pathways on towpaths along the canals, which are extremely pretty.